The Brahmagiri, Pushpagiri and Talacauvery regions have plenty to offer for the avid trekker and nature lover. At an elevation ranging from 4500 to 5800 feet, the landscape is diverse and breathtakingly beautiful. 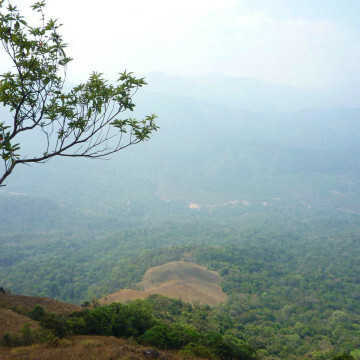 The hills are studded with scenic coffee plantations, panoramic views, majestic waterfalls and thick shola forests. Trekking in Coorg is perhaps the best of leisure activities in the region – apart from the many popular routes, there are several more known only to locals. We give you the opportunity to embark on a trek through the lesser-known routes to the beautiful peaks of the region, with the aid of local tribes and planters. Arrive at 9.00am at your chosen point (Madikeri / Sidapur / Virajpet). You will then be driven 20-25 km to start your trek, with a local guide accompanying you at all times. You will trek in the beautiful hills of Coorg, enjoying panoramic views as you pass waterfalls, shola forests and coffee and spice plantations. Your trek will last until approximately 4.30pm. A packed lunch, refreshments and transportation from pick-up points are all included. Note that while treks are conducted throughout the year, waterfalls are seasonal and in the rainy season you may expect leeches.